To commemorate the tenth anniversary of the magazine Salman Rushdie called one of a handful of journals on which “the health of the American short story depends,” Lookout Books announces the publication of Astoria to Zion: Twenty-Six Stories of Risk and Abandon from Ecotone’s First Decade. Ecotone has established itself as a preeminent venue for original short fiction from both recognized and emerging writers, with more than twenty stories from our first sixteen issues reprinted or noted in the Best American, New Stories from the South, Pushcart, and PEN/O. Henry series. With the publication of this anthology, Lookout Books makes a permanent home for the vital work of regular contributors Steve Almond, Rick Bass, Edith Pearlman, Ron Rash, Bill Roorbach, and Brad Watson, along with rising talents Lauren Groff, Ben Stroud, and Kevin Wilson, among others. 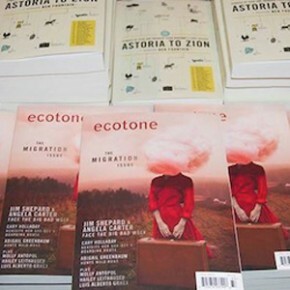 “Ecotone defines itself as the magazine for reimagining place, a claim that deserves to be applauded as a rare instance of truth in contemporary advertising. In an age where place has never seemed more tenuous and abstract, it’s hard to conceive of a more relevant mission for a literary magazine,” writes Ben Fountain in the Foreword. In keeping with the magazine’s mission, the collection explores transitional zones, the spaces where we are most threatened and alive. Though the release date isn’t until March, we thought we’d get in the giving spirit a little early. What better way to introduce readers to the best of Ecotone than a taste from each story? Every Monday over the next several months, we’ll post the first paragraph from a featured story in the collection. So look for the series every Monday and be sure to check our blog for additional updates. Don’t forget to follow us on Facebook too!